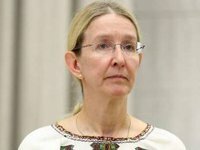 The World Bank supported Ukraine on the way to medical reform and is ready to continue to help Kyiv in this direction, Acting Minister of Health Ulana Suprun has stated following a meeting with World Bank Group President Jim Yong Kim in Kyiv. "The World Bank has repeatedly supported Ukraine on the way to medical reform and is ready to help further improve the health care system. There is the general ambitious project "Improving Health in the Service of People," which works in eight regions of Ukraine and helps provide quality medical care and prevention to their residents. Thanks to international partners from the bank for helping Ukrainians live a healthier life. I hope for expansion and the deepening of cooperation," Suprun wrote on her Facebook page. She said that, together with the World Bank Group President, she visited Center for Primary Health Care No. 1 and Clinical Hospital No. 15 in Kyiv. "Jim Yong Kim congratulated our doctors on the legislative changes that will allow the health care system working according to new, modern and fair rules," she said. She also expressed gratitude to the doctors "who are already preparing for the changes." As an example of such training, she named Center for Primary Health Care No. 1, which already works with the E-Health system.